It is official. After months of dire warnings regarding the impending breach of the U.S. debt ceiling, the moment has finally arrived: The current U.S. debt ceiling of $14.294 trillion has been hit. In essence, this is the legal debt limit imposed by the Congress. That means that, as of May 16, 2011, the U.S. Federal government has lost its ability to borrow money from the public through the issuance of debt securities, like Treasury bonds. Washington has lifted the debt ceiling 10 times over the past 10 years. 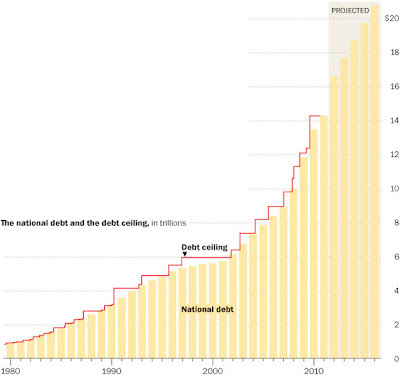 The chart below shows how the debt ceiling has increased since 1980. In an effort to prevent a default, the Treasury department is expected to announce later today that it will immediately stop issuing and reinvesting government securities in certain government pension plans. However, these emergency measures will only extend the timeline of government default to August 2. In typical fashion, Republicans and Democrats are using the debt ceiling debate to get the upper hand politically in today’s headlines. While “Rome” burns, the lipstick is carefully being applied to the pig. As I have been saying since 2006, we are now officially in the final stages of the American empire. The only thing that is unbelievable about today’s political climate is that any American citizen actually buys into anything said in Washington. Today, the lawmakers and the mainstream media have succeeded in pinning the blame on corporate America, on the rich, big oil, the top 1%, etc… They also will blame the poor, the unemployed, the homeowner, the business owner. You name it, they blame it. However, the real problem today is the political system in Washington. Although, you must admit, it all does make for a really good show. So pull up a chair and watch those “cost-cutting” Republicans take on those “socialist spendthrift” Democrats. Starring: Barack Obama, Nancy Pelosi, John Boehner, Paul Ryan, and the list just goes on. It is such a star-studded show. They plunder and they manipulate you, and then ask you for more “campaign” dollars to start it all over again. This game is just about as real as modern-day wrestling. But at least it requires a little more thought. Nonetheless, somewhere during the show, perhaps during the intermission, you may want to begin preparing a financial lifeboat for you and your family. Why? Because if history is any indicator, this movie has a bad ending.